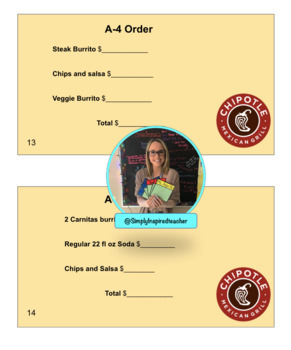 Chipotle Restaurant Task Cards! 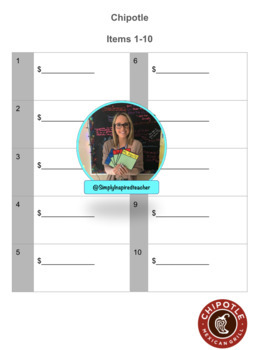 This product is designed to help students learn how to read and interpret menus. This product can be used by printing it out for each student for a centers activity, or for task boxes. All you need to do is print, and laminate. Students can then write on the task cards, or on the answer sheet depending on students level and ability! This resource has two sets that are differentiated based on the students level. 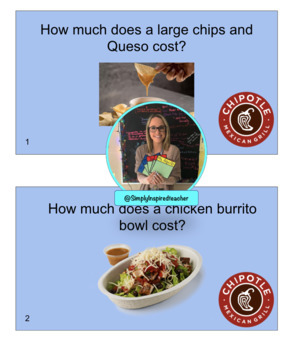 Basic Menu Reading (blue cards): Students look at the menu and answer the question. No inferential questions. Basic (right there) questions. Math Menu Reading (Yellow Cards): Students look at the questions and write down the amounts for the items. Then students add up the total cost for the items.